The token you use to log into the system. Typically this will be identical to your version control login name. Normally, you cannot edit your own login name. However, system administrators are able to edit anyone's login name, so contact an administrator if you need this done. The password needed to log into the system. Can be blank for "no password," although in all cases the password will be displayed with many dots as shown in the screenshot above. This prevents the causal observer from knowing anything about your password, even its length. When changing your password you have to type it in twice to confirm. Your first and last name, respectively. If your server uses LDAP or AD authorization, these fields are read-only. Name of your department, if any. If your server uses LDAP or AD authorization, this field is read-only. Your display name. This is displayed to other users everywhere in the system. You can change this setting at any time. If you leave this field blank your login name will be used for your name. This is undesirable however; most other users will not know you by your login name. The phone number other users can reach you at. This field is optional. Your time zone. This will be used to determine users's displayed date/time. This is defaulted to the time zone selected on the Collaborator server. This field is used by system administrators to determine whether you are allowed to log into the system. If you are looking at your preferences, you can log in, so you will always see this as "enabled". Controls whether you have permissions to manage templates. Typically, you are not able to change this field, unless you are an administrator. Controls whether you have permissions to manage custom fields. Typically, you are not able to change this field, unless you are an administrator. Controls whether you have permissions to manage checklists. Typically, you are not able to change this field, unless you are an administrator. Controls whether you have permissions to manage roles. Typically, you are not able to change this field, unless you are an administrator. Controls whether you have permissions to manage automatic links. Typically, you are not able to change this field, unless you are an administrator. Controls whether you have permissions to create child groups. Actual for group administrators. Typically, you are not able to change this field, unless you are an administrator. The email address that you want all notifications delivered to, and also to display to other users in the system in case they want to contact you directly via email. Although this field is technically not required, you really should fill it in, and if you do not, you will get a warning in your Action Items list. Get all notifications, even if you were the cause of the notification event. Get notification only of those events that you did not cause yourself. 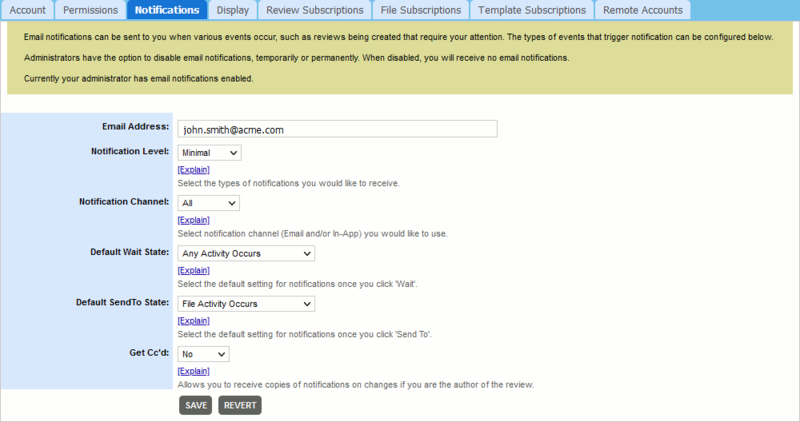 This allows you to receive copies of notifications on changes if you are the author of the review. Controls whether those little yellow tutorial boxes are displayed throughout the system. By default, these boxes are displayed to help you understand the user interface. Controls how file revisions are displayed, alphabetically or by order of upload. Allows the selection of the default display mode (Overlay or Separate) of materials on the Review Screen. Controls which style should be used to display files within a changelist. Choices include Compressed Tree, Tree, or Flat. When enabled, the Review Screen is presented in a format that uses less vertical space. Specifies which of pre-defined Web Client themes you would like to use. This setting overrides the default WebUI theme selected by administrator. The last two digits of the year (that is, 2001 would be displayed as "01"). The full year (that is, 2001 would be displayed as "2001"). The one- or two-digit month number. The two-digit month number. Single-digit values are preceded by a zero. The one- or two-digit day. The two-digit day. Single-digit day values are preceded by a zero. The format pattern includes the elements specified above separated by the desired symbols (:, /, spaces and so on). These symbols will be used as separators for the shown date/time values. The one- or two-digit hour. The two-digit hour. Single-digit hour values are preceded by a zero. The one- or two-digit minute. The two-digit minute. Single-digit minute values are preceded by a zero. The one- or two digit second. The two digit second. Single-digit second values are preceded by a zero. The time would be displayed in the 12-hour format. The alphanumeric time zone offset from UTC (that is, Pacific Standard Time would be displayed as "UTC-8"). The four-digit time zone offset from UTC (that is, Pacific Standard Time would be displayed as "-8000"). Allows the user to select which file revisions (if available) will be compared, by default, when the Diff Viewer is launched. All - Compare the current revision of a file against its base revision - that is, a state of file before any changes related to current review have been made. For pre-commit reviews, base revision is the revision that you checked out from the repository. For post-commit reviews, base revision is the revision that precedes your commit. First vs Last - Compare the most recent revision of a file against its first revision that was uploaded during this review. Branch only - Compare the current revision of a file against its base revision excluding changes merged from other branches. Last commit - Compare the current revision of a file and its previous revision. Accepted - Compare the current revision of a file against its latest accepted revision. During the review, participants may accept some particular revisions of a file to denote that they agree with the changes. Uploading a further revision of that file clears the Accepted mark. If a participant has not accepted any revision yet, then compares the current revision of a file against its base revision. Commits - Compare the most recent revision against any arbitrary revision chosen in the Select revision drop-down. The Branch only mode may produce slightly different output depending on whether the review was created manually or via repository integration. 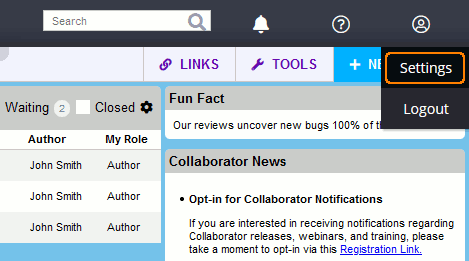 In reviews created manually it is not always possible to filter-out merge changes, so sometimes they still could be displayed. Reviews created via integration have broader access to the repository and thus can exclude merge changes more thoroughly. Specifies whether Diff Viewer should display the next page when reached the end of current page in document reviews. Specifies the default zoom level when reviewing Word processing and PDF documents, presentations, images and vector graphics. You can set the scale to various percentages, Page Width or Full Page. Provider - Display provider type, like 'git', 'mercurial', 'none', 'local changes', and so on. Creation Time - Display item creation time. Item ID - Display unique item identifier. For example, commit ID. Description - Display item description. For example, commit message. Controls whether white-spaces are taken into account when showing differences. This setting affects how line differences are displayed in Diff Viewer. Once enabled, line numbers and conversation position displayed in Diff Viewer may vary from line numbers and conversation position displayed in Review Screen and reports. Controls whether capitalization is taken into account when showing differences. Controls whether COBOL sequence numbers are taken into account when showing differences. Review Subscriptions allow you to automatically subscribe and be included in reviews with a preferred author. In the Review Author field, select the login name of the user to whose reviews you would like to be subscribed. If no authors are selected for a given review, the subscription will use the name of the review creator instead - unless the review creator is flagged as a system admin. Choose your role type (Reviewer, Observer, or Moderator) in the review in the My Role field. Keep in mind that actual role names may vary depending on your role configuration. File Subscriptions allow you to automatically subscribe and be included in reviews where a particular file is under a review. Choose your role type (Reviewer, Observer, or Moderator) in the My Role field. In the File Pattern field, enter an Ant-style expression as the pattern to match the file(s) of interest. The expression will be matched to the file path and repository name; it will not look for matches in the complete repository path with URL and other server descriptions. Ant-style expressions can include "*" to match any substring within a given directory, or "**" to match any substring of any length, ignoring directory separators. If possible, avoid beginning the pattern with wildcard characters as it can significantly decrease the performance of subscription processing. 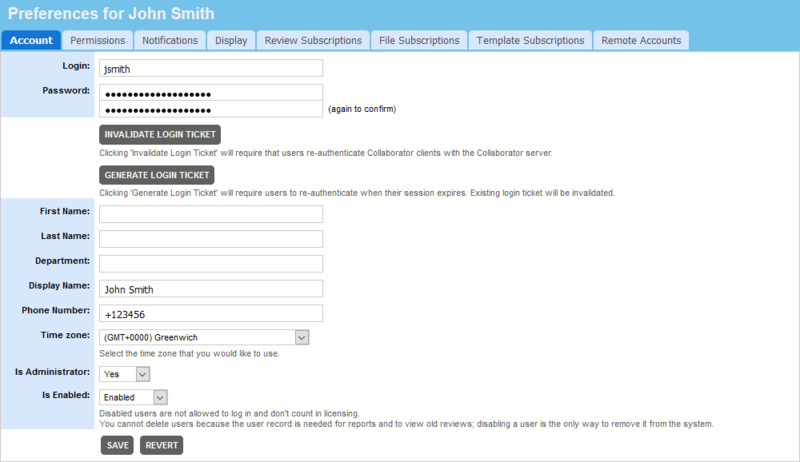 Template Subscriptions allow you to automatically subscribe and be included in reviews having a particular template. Select the name of a template you would like to subscribe to in the Review Template field and specify your desired role type (Reviewer, Observer, or Moderator) in the My Role field. Remote Accounts allow you to specify correspondence between your user name in Collaborator and your logins on various remote servers. These settings are used to match user names for Collaborator integrations with remote servers. See Link User Accounts.